Syska is known to be the name of an idealist brand which offers realistic, simple and long term solutions using advanced technology. Established in the year 2002, Syska LED lights are a smart innovation of lighting Industry which performs at ease. These are developed to meet global quality standards. Choosing a light bulb plays an important role in taking the look of room to next level. So, if you are planning to replace the bulbs in your rooms with something better and economical, Syska LED bulbs are perfect. Syska SRL Base B22 9-Watt LED Bulb is known to be an economical one which uses advanced technology of plastic aluminum thermal management offering longer lifespan of about 5000 days. A non-toxic bulb with low power consumption provides you with decent light. Overall it’s a very good product. 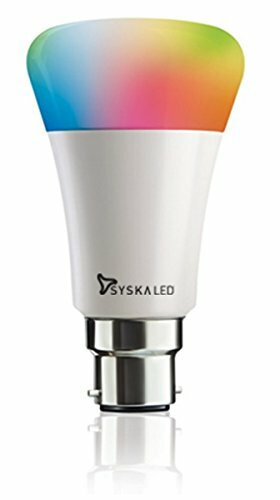 Syska Smart Light LED Bulb with 7W capacity uses wireless technology allowing you to access almost 3 million shades with the life of 25000 hours. The Bulb is compatible with Android smartphones and IOS smartphones. 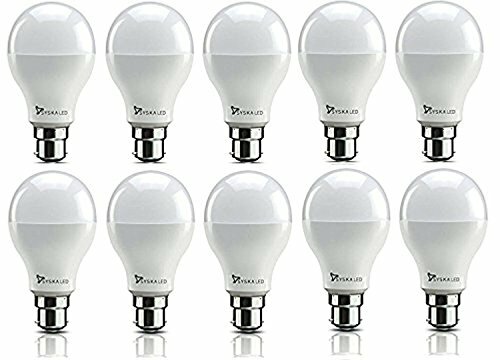 Syska Smart Bulbs are best among other Smart LED Bulbs in India. 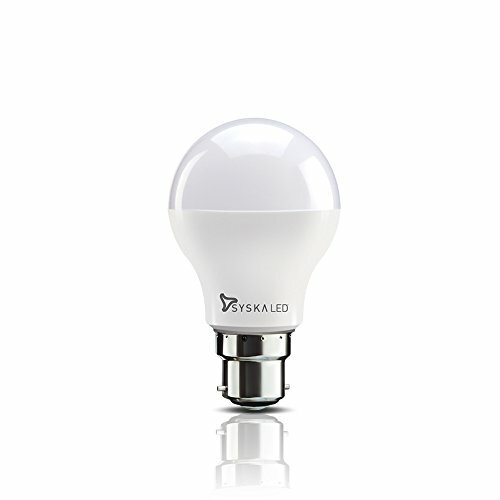 The Syska Base B22 with 9W capacity offers color temperature of 6500K, lumens 810lm which is highly efficient, eco-friendly, power saving and no mercury Bulb. It provides omnidirectional lighting effect to your rooms. 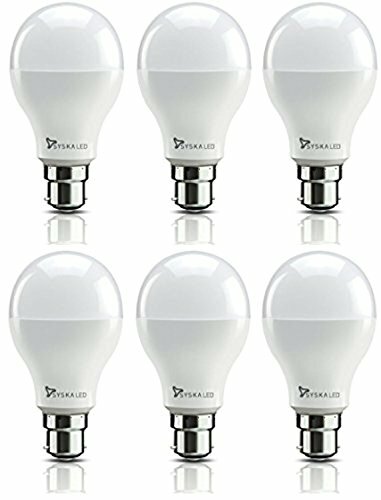 SSK-SRL-9W LED bulb is a package of 12 Bulbs of an unbreakable bulb Which is sturdy built which enhances the home decor and offers a longer life with maximum efficiency. Syska B22 LED Bulb with 5W capacity is highly efficient which saves energy up to 90%. It is made up of polycarbonate material with no mercury and it is an eco-friendly product. 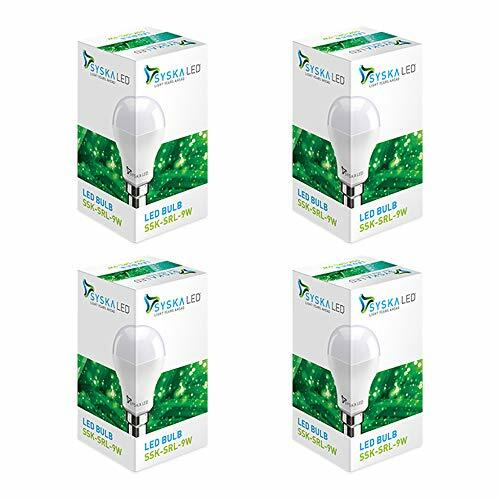 Syska Base B22 with 9W capacity LED Bulb is a cool white colored, comes with a package of 5 Bulbs offers great life, low power consumption, and power saving ability and maximum efficiency. It is best to light up your room in a suitable way. 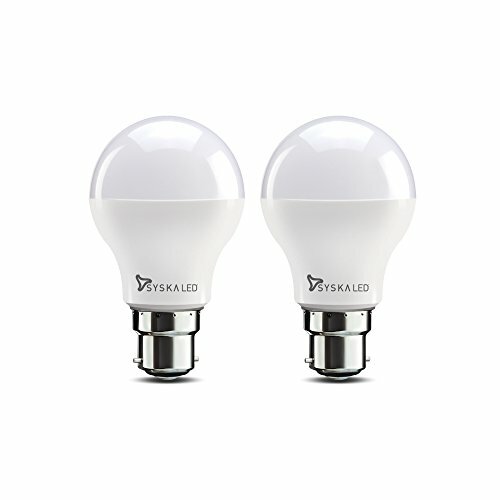 This special Syska Base B22 with 5W LED bulb is a pack of 2 omnidirectional, highly energy efficient and power saving bulb which is also eco-friendly and does not include mercury is known to be one of the best that Syska offers. Syska Base B22 9W LED bulb is a smart innovation by Syska providing good color rendering bulb which is energy efficient, environment-friendly, offers solutions for household or workplace applications. It is a pack of 6 bulbs so it is worth buying. Overall it’s a simple and lasting light solution one can opt for. Syska B22 LED Bulb with 9W capacity is a low priced omnidirectional illumination saving 90% of energy. It comprises 90-300 volts of power and 810lm. Addition to that it is eco-friendly and user-friendly. 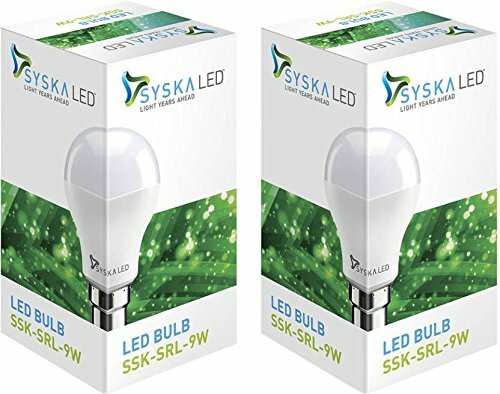 Syska SSK-SRL B22 LED Bulb is a pack of two LED Bulbs with 18 Watt capacity is designed to handle fluctuations between 90-300 V. This one is an economical option as it provides longer life i.e, 50000 hours with maximum efficiency and lights up the room delightfully. Power: 18 watts; Operating Voltage: 90-300 volts. Syska Bulbs are designed to handle fluctuation between 90 - 300 V.
Syska SSK-SRL-9W base B22 LED Bulb is made of a polycarbonate material. It is a pack of two energy efficient bulbs saving power and has a long lifespan. They are mercury-free LED Bulbs which creates a relaxing ambiance in your room. 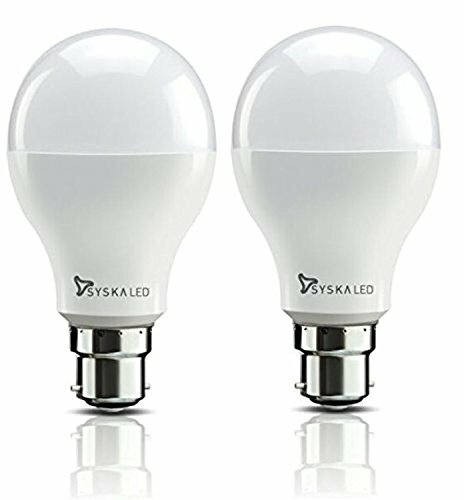 Syska SRL Base B22 20 Watt LED bulb gives elegant look, consumes less energy, Omnidirectional illumination with 2000 lumens and cool white color. It comes with a pack of two giving maximum efficiency. Syska PAG Base B22 5-Watt LED Bulb is a Pack of 6, Cool White colored Bulbs which acts as a replacement of CFL Bulbs. These are omnidirectional, economical and user-friendly product works best. Overall it’s the best among 5W capacity category. Syska B22 9-Watt LED Bulb is Cool Day Light bulb, comes with two effective bulbs with the lifespan of 50000 hours and saves energy up to 90%. It is more popular in 9Watt LED Bulb category. 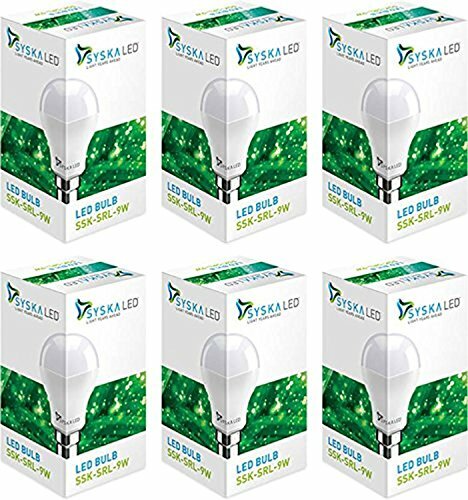 How to choose best LED Bulbs from Syska? In order to make a wise choice, you will have to look into basic features that the bulbs offer. • Power consumption: one of the most important feature to be considered is the power consumption. Syska offers varied levels of power consumption from those of as low as 5W to that of 21W. This is a measure of energy that the bulb consumes. If you want a most economical bulb, you can choose Syska bulbs with lower power consumption. • Rating: To check the rating of that particular product before buying is very much necessary. Rating is an evaluation of a product in terms of quality, quantity etc given by consumers based on their experience with the product which helps us in making an effective choice. • Price: Price is one of the important features to be looked into. Syska offers various price range LED Bulbs with good quality. • Warranty: It’s better to buy products with Warranty as you can claim them when the product is inoperative. Syska provides you with 2 Years of warranty on its Bulbs. Is Syska an Indian company? Syska LED Lights Private Limited was incorporated in 2012 and is headquartered in Pune, India. So, yes it is an Indian Company. Who is the owner of Syska LED? The dynamic duo of brothers, Mr. Govind Uttamchandani and Mr. Rajesh Uttamchandani lead the Syska Company. It was started under the guidance of the Late Shree Jeevan Uttamchandani. How to claim Warranty for LED Bulb and Where to find LED Bulb Repair Centers? In case of Warranty claim, you will have to contact Syska Customer Care on their toll-free number. The number will be available in their site or on the product package or you can also claim from any Syska dealer in your city with your invoice. There would not be any Repair Issues in LED Bulbs. 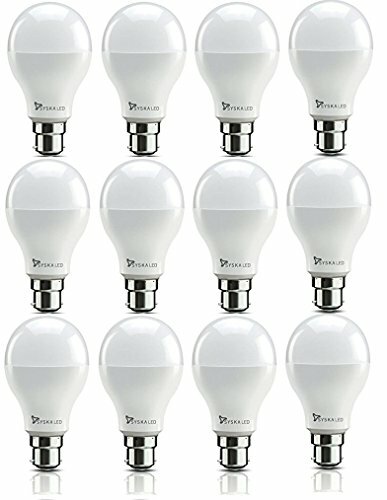 Hereby, we believe the above mentioned are the 14 best Syska LED Bulbs to buy at the best prices in India. @Samantha, if you have a doubt on that, I’d like to bring one more question in your mind.. “syska led street light” – does this also leave a question?